It’s a harsh reality, the mobile app market is excitedly competitive and only businesses that have original, useful and stunning apps can succeed in it. If you really want your business grab the attention in the crowded marketplace, then you need an app to propel your product to stardom. Once you’ve done that the question is: how to spread the word about it to get a flood of downloads? A great app marketing strategy might be required to build a loyal user base and create a flow of downloads. 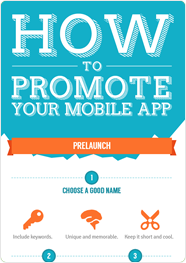 Well, a handy infographic guide is here to help you market your mobile application in the most effective way. © 2012 Per Square Media Pty Ltd. All rights reserved.